Before driving, adjust the inside and outside mirrors. Be sure to look over your shoulder before changing lanes: Changing lanes without taking into account the actual distance of the vehicle in the convex mirror is dangerous. You could have a serious accident. What you see in the convex mirror is closer than it appears. The wide angle mirror has two curvatures on its surface separated by a region line into outer and inner regions. The inner region is a standard convex mirror whereas the outer region allows for a wider range of visibility within the same sweep. This combination allows for better assurance when making lane changes. The perceived distance of objects in the outer and inner regions of the wide angle mirror is different. Objects appearing in the outer region are actually further away than they are in the inner region. The ignition must be switched to ACC or ON position. Rotate the mirror switch to the left or right to choose the left or right side mirror. Press the mirror switch in the appropriate direction. 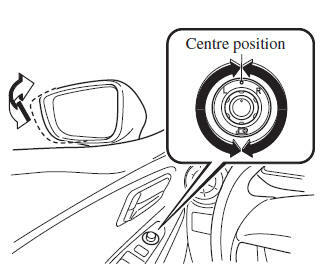 After adjusting the mirror, lock the control by rotating the switch to the centre position. Always return the outside mirrors to the driving position before you start driving: Driving with the outside mirrors folded in is dangerous. Your rear view will be restricted, and you could have an accident. Fold the outside mirror rearward until it is fl ush with the vehicle. To fold, rotate the switch. 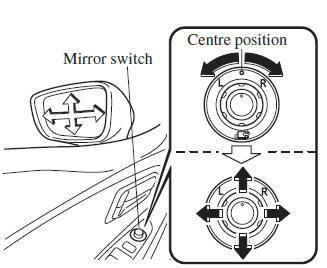 To return the mirror to the driving position, rotate the switch to the centre position. Do not touch a power fold-in mirror while it is moving: Touching the power fold-in mirror when it is moving is dangerous. Your hand could be pinched and injured or the mirror could be damaged. Use the power fold-in switch to set the mirror to the on-road position: Setting the power fold-in mirror to the on-road position by hand is dangerous. The mirror will not lock in position and will prevent effective rearview visibility. 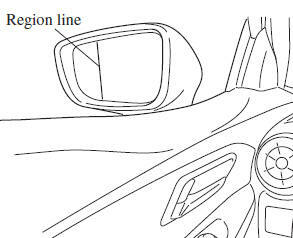 Only operate the power fold-in mirror with the vehicle safely parked: Operating the power fold-in mirror while the vehicle is moving is dangerous. Wind blast on the mirror will cause them to collapse and you will be unable to return it to the on-road position, preventing rearview visibility. The outside mirrors can be operated for about 40 seconds after the ignition is switched from ON to off with all doors closed. If any door is opened, the outside mirrors will stop operating. Do not stack cargo or objects higher than the seatbacks: Cargo stacked higher than the seatbacks is dangerous. It can block your view in the rearview mirror, which might cause you to hit another car when changing lanes. Before driving, adjust the rearview mirror to centre on the scene through the rear window. Adjust the mirror with the antidazzle lever in the day position. Push the antidazzle lever forward for day driving. Pull it back to reduce glare of headlights from vehicles at the rear.